Experience the future of mobile technology with the HUAWEI Mate X. The new folding design integrates a new era of communicative interaction. Keep it compact for daily smartphone tasks or unfold to reveal an exceptional experience in multitasking or entertainment. 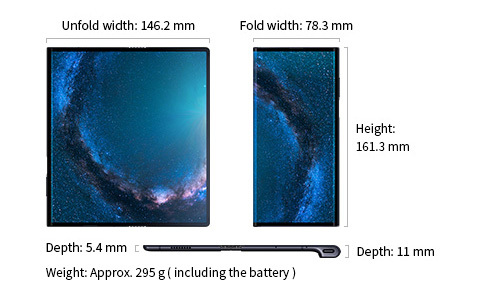 Huawei Mate X defines a new category of mobile devices by adopting flexible display. The soft screen can bend and stretch numerous times without compromise. Prepared to be surprised by its innovation and groundbreaking performance. The HUAWEI Mate X is declaring a new epoch for screen design that is now edge-to-edge for a real HUAWEI FullView. Bring freedom to your eyes with a wider view and enchanting colour in the bright OLED display. Unfold it in a second and use it as a 8″ tablet. You immediately gain almost twofold of your viewing area to browse news, handle files, play games or watch videos. The synergy with a phone and tablet unlocks future potential to enhance your life everyday. Experience boundless proficiency in Split Screen mode. Now, you can drag an image to your email or write a memo while searching on the browser and overcome your work challenges more efficiently. Ushering in the 5G revolution with the HUAWEI Balong 5000, the world’s first 7nm multi-mode 5G chipset achieves the industry-leading 5G download speed. The HUAWEI Mate X with Balong 5000 officially unlocks a new experience in the 5G era. The advanced dual sim provides extensive access to 2G / 3G / 4G / 5G frequency bands around the globe. Leading the 5G evolution, HUAWEI Mate X also supports Standalone 5G network which will be the mainstream solution in the future. This forward-looking technology focuses on unmatched connectivity anytime and anywhere. A compact hand-held bar design with a re-designed Leica Camera System perfectly balances the pursuit of a slim body and comfortable grip. On the back with a futuristic Interstellar blue, a new material is adopted to allow uninterrupted 5G signal. A harmony in photography with an integration of the rear and front cameras. Capture all your best moments and take striking selfies with the same advanced and intelligent Leica Camera System. The power switch is integrated with the fingerprint reader into one fast and secure button. Be recognised within a second and start your day with just one touch. With the world’s fastest 55 W HUAWEI SuperCharge, you can charge the phone up to 85% in 30 minutes. No interruptions to your daily schedule. With great power comes more productivity and the advanced battery design in the HUAWEI Mate X, opens the door to greatness. You will have more power to work on projects, watch movies and play all your favourite games. The Huawei Mate X comes in only one color variant, Interstellar Blue. The Huawei Mate X price globally has been set at EUR 2,299 (roughly Rs. 2,09,400) for the 8GB RAM/ 512GB storage variant. The smartphone will go on sale from the middle of 2019.